We decided to engage Out There Landscapes and Design to prepare our plan. You can read more about our concept meeting with Emily in this post. After only one round of changes, Emily sent us the final plan incorporating as much of our ideas on paper as possible but keeping the planting schedule to the minimum required by our council. We are very happy with our experience with Emily and her team. The process couldn’t have been more simple, straight forward and fun! What a contrast when compared to where we are with Metricon right now. 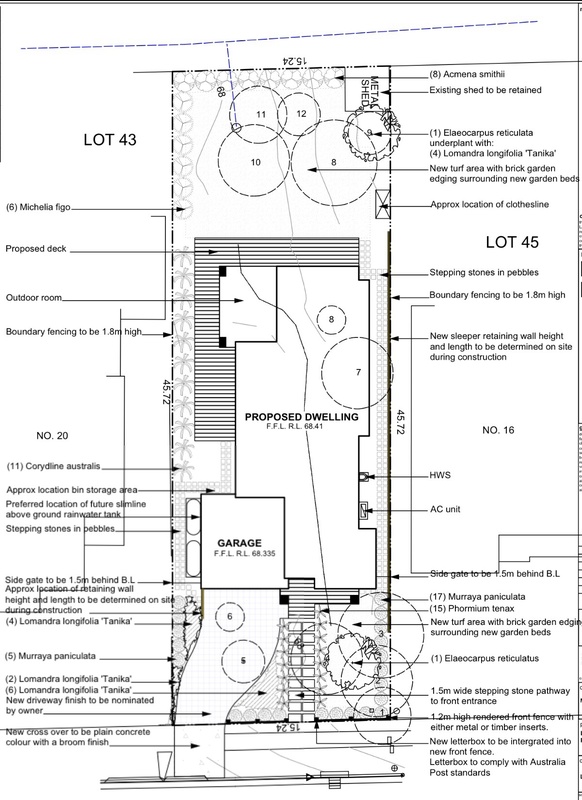 We will use this plan as a starting point when we get around to doing the front and rear yard but given our current dramas with the house plans, it feels very much like such a long road ahead. Very happy that you’re clicking with your landscaping team. It’s looking great, though I have to admit to being unfamiliar with many of those plant names, though I did recognise Murraya paniculata and Cordyline australis. To be honest I’m not familiar with the plants she’s used on the plan. She’s kept it simple within the guidelines of our council to get a fast trouble free approval. We’ll be using this plan as a baseline for the actual landscape construction down the track. I know some people DIY the landscape plan for the DA but we wanted an opportunity early on to use a professional to get a general concept for the garden. We are taking a slightly different approach to landscaping and having a plan drawn closer to handover. The council required a landscaping plan as part of the approval so M just gave them something very simple. We’ll see how we go with the budget after handover. We had an initial quote for the wrap around deck and it came in at 30k! Eeeek! That was for merbau so we may have to use cheaper timber or reduce the decking area.